Care: There is usually a waiting period of 12 months for some health funds. Also not all levels of cover are covers for orthodontic treatment. Some funds require a treatment plan to be submitted before commencing. Do your homework and don’t get surprised! Now back to the numbers. This is the placement of bands on six or less teeth in either the upper or lower jaw. They are joined by an arch wire that changes the position of the teeth or shape of the arch. This is the full railway tracks, jaws and other wonderful clichés that have described the placement of brackets and arch wire on one jaw only. This also involves its removal and the end of treatment. The item also includes providing a retainer appliance that can be removable or fixed. 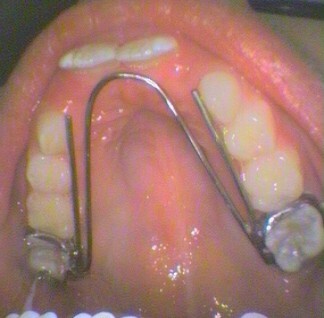 This holds the teeth in the new position and prevents the tongue and lip from moving the teeth back. This is usually at least six months. This involves an appliance that is fixed (i.e. cemented or bonded onto the teeth) on the palate (palatal) or tongue (lingual) side of the teeth. Usually placed in the molar teeth area, to change the arch form, or to uncross or straighten teeth. This is particularly useful when baby teeth are in cross bite together with the first adult molar. By correcting the cross-bite early, it will reduce the cross-bite happening in the permanent teeth that follow. Usually crowding is reduced as the widened arch creates more room for the adult teeth to move into.